Antique Map South-East Asia by Blaeu titled ‘INDIA quae ORIENTALIS dicitur, ET INSVLAE ADIACENTES’. 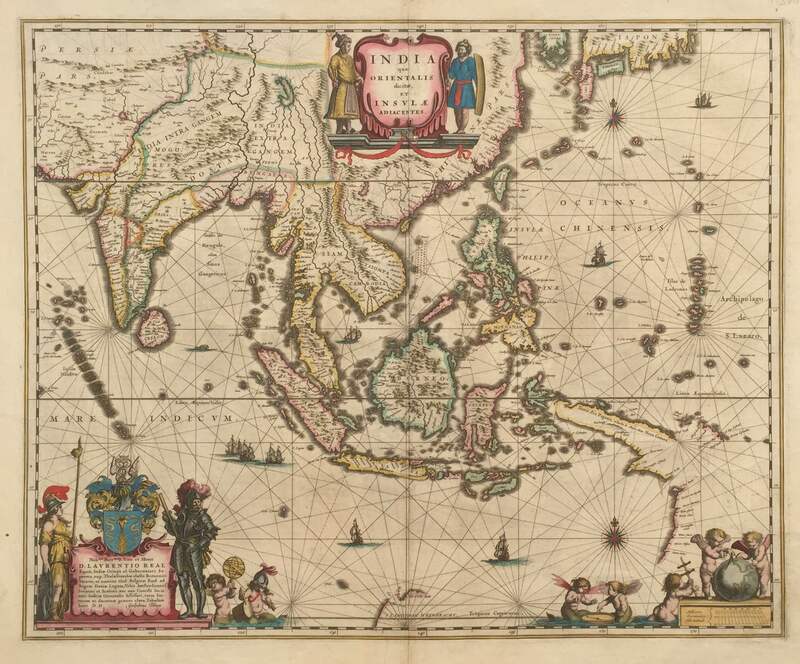 The famous and much sought-after early 18th century map of South-east Asia by the great Dutch cartographer William (Guiljelmus) Blaeu (1571-1638) first published in the two-volume Nieuwe Atlas (Koeman, Volume 1, page 105, map signature B) in 1635. This hand-coloured map, from the German language edition of 1642 (signature B), contains a dedication to Laurens Reael, VOC Director in Amsterdam and former Governor General in Asia, who was a personal; friend of Blaeu’s and who probably helped Blaeu obtain the copper plates from the VOC Directors for the new two-volume 1635 atlas. Very good condition on thick hand-made paper; some professional restoration along bottom of centre-fold, measures 41.0 x 50.3 cm.